It is appalling the number of manuscripts we receive for review for Knowledge Organization, that are about things like ontologies and taxonomies and domain analyses, and that cite absolutely no literature from the domain of knowledge organization. Usually my first intuitive reaction is to think the authors simply were negligent in submitting their siloed papers to us without checking that our journal is published by a scientific society that might expect its own science to be used. Sometimes I have a second intuitive reaction that the authors are so siloed they do not even know that domains other than their own exist and have their own literatures. I suppose both of these are true to some extent. Lately I have come to see that there is increasingly no connection–no synthesis, no syndesis, not even any syncopation–in the evolution of theory. I think this has something to do with the habits of researchers to conduct so-called literature reviews online using Google Scholar, or worse just Google alone, and never bothering even to go to the many multi-disciplinary indexing services available online through most research libraries (this ought to be demonstrable empirically; perhaps one could take a random sample of published articles and actually search for relevant literature? Never mind that this is the responsibility of peer-reviewers!). Internet resources usually provide something quasi-relevant (remember Patrick Wilson’s excoriation that relevance often means “satisfactory”?–see Two Kinds of Power), enough to fill out the tiny tweet-like excuses for paragraphs most people manage to type these days. But this is no proper approach to science. Theory requires connection and connection requires sequence in human thought. In order to make sense of an empirical observation all of the science available that can be brought to bear must be connected. To move that empirical observation forward as an hypothesis, or to move the hypothesis forward as a theory requires that observations be classified cumulatively. It all requires “syn”–synthesis, syndesis, syncopation. If either of the people reading this blog are considering contributing to the science of knowledge organization let them hie at once to the ISKO website and use the powerful new KO literature search tool: http://www.isko.org/lit.html. While they’re at it, let’s urge them to go to the ISKO member’s portal at Ergon-Verlag http://www.ergon-verlag.de/isko_ko/ where they now can find KO from 1993 to the present and AIKO from 2006 to the present (and soon will find the entire backlog). Accuracy in all aspects of scholarship is critical. It seems increasingly to me, as a journal editor, that authors are taking less care with citations than ever before. It’s a bit like what we hear about pilots getting lax because they know their planes have autopilot—authors no longer make extensive files of source publications because they can view an abstract online with a couple of clicks and use one or another citation service to get automatic citations. One problem for another time is how this seems to lead to ritual citation. But more to the point of this post, it leads to errant citations, if the author is pasting from a citation service (or worse, from another paper whose author pasted it, etc., etc.) rather than keying a citation from a source document. Of course, the story I’m about to tell might just not have anything to do with any of this; I’ve no way of knowing how this happened. 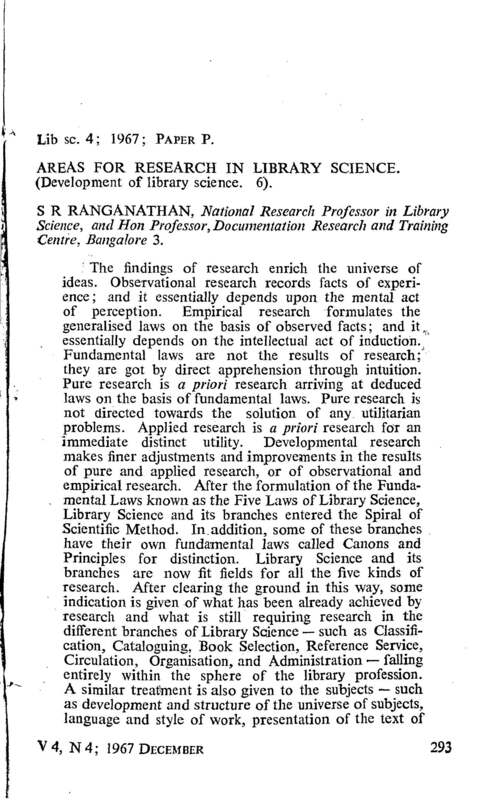 Ranganathan, S. R. 1967. Areas for research in library and information science (development of library science. 6). Library science 4: 235-93. Immediately one question was obvious, and that was why there was something like a series statement in the title portion of a journal article citation. I asked my colleagues to verify the citation and was told nothing like that could be found anywhere. We all tried looking it up in various ways. It seemed very curious that we could not find this citation online (but then again, 1967 was eons ago in digital journal time). It also was not possible to locate any journal with exactly the title Library Science from this period. I decided to turn to our ISKO colleagues by placing a notice on ISKO-L. Within a few hours I had several responses from around the world, acknowledging that we had found the correct title, and apparently the citation had employed a formerly standard title abbreviation. Paper copies of the journal were located. And even more oddly, European colleagues were able to find the digitized article online using Google. Now, why couldn’t we do that from the U.S.? I also heard from others in the U.S. who couldn’t find it online! How bizarre! Sure enough, there is a series statement in parentheses within the title, and the title does not say “and information science” and the journal title is Library Science With a Slant to Documentation. The upshot is there were at least three inaccuracies in the original citation, so it was good thing we chased it down rather than creating a bibliographic ghost by publishing it in erroneous form. But it also was a lesson in the pitfalls of relying too heavily only on our digitized sources. As I tell my doctoral students, who inevitably groan and refuse to believe me, a scholar has to look at the actual sources to verify their veracity. The mystery was resolved and the correct citation appeared in Knowledge Organization. Thanks to Kathryn La Barre, Gerhard Riesthuis, Thomas Dousa, Vivien Petras, Joe Tennis, F.J. Devadason and Kothi Raghavan for helping resolve this little mystery. And remember, apparently, caveat emptor applies to citations.